When there are excess levels of toxins, we can notice symptoms on our skin such as rashes and itching, redness and break outs, dullness and dehydration. When our bodies become fatigued and run down our organs find it difficult to eliminate waste and the tell tale signs can be found on our skin. 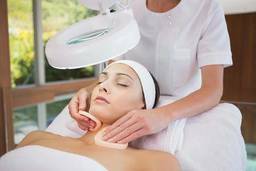 For example breakouts in the middle of the chin are related to poor digestion and the jawline can reveal hormonal issues, eczema can be a sign of stress or auto immune disorders. Chinese medicine has relied on face mapping for centuries to diagnose health problems. This is why taking the time to care for your skin is a vital part of the detoxification process. Australia has the highest rate of premature ageing in the world. We have a harsh environment with a high rate of emissions as well as the strongest sun exposure. Our skin is our first line of defence when it comes to protecting our bodies from environmental damage BUT it is the last organ to receive nutrients from food and water which is why it is so important to apply products topically morning and night. It sounds like we need to spend the rest of our days hidden away in toxin free bubble but thats just not the way life is. Our bodies are designed to protect themselves naturally, but we must learn to read the signs and know when its time to start taking better care of ourselves. Committing to a cleanse with regular exercise is the best way of resetting the bodies immune system. At Bondi Vixen the Kickstart is a three week detox and exercise programme offered to members and non members. It is designed to reset your mind and body with a shred diet plan and bespoke training to suit your body. Complimenting this process by assessing your skin and how you are looking after it at home will put you on a path to wellbeing inside and out. It is important to understand your skin concerns and what results you are looking for. What works for your friends skin may not be right for you. This is why a skin consultation with a professional is always beneficial before investing in any products. Regular treatments are an excellent way to maximise any skincare routine. Monthly facials means you are working your skin out, like taking it to the gym and seeing your trainer, taking it to see your skin therapist keeps you on track for the best results.